This paleo pumpkin breakfast bake is an autumn dream! 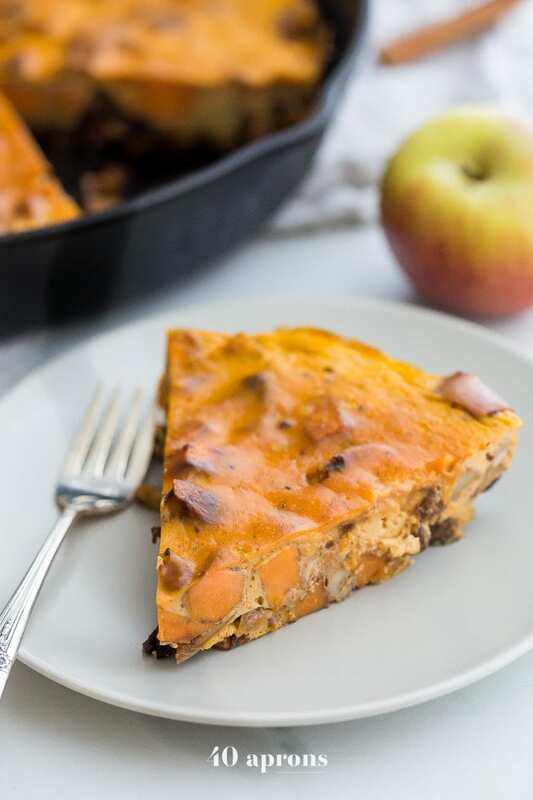 With sweet potatoes, apples, pumpkin, pumpkin spice, walnuts, vanilla bean, and plenty of eggs for protein, you’ll fall head over heels in love with this fall breakfast bake. Pretty sure it might just become your favorite paleo breakfast bake altogether! I can’t stand the thought of another savory breakfast. I’m not a major breakfast lover to start with: I feel like my body needs a good chunk of time to get hungry in the mornings. But if I am to eat a big breakfast to start my day, I prefer it to be a bit sweet or super savory. I’ll take a bowl of quinoa with raisins and maple syrup, please, or hey, what about a fried steak with chimichurri? I’ll even eat chicken tikka masala in front of the fridge with the door wide open, scooping it straight out of the Tupperware and to my mouth as quickly as I can manage. But eggs? The texture… the repetition… I just can’t. Normally. 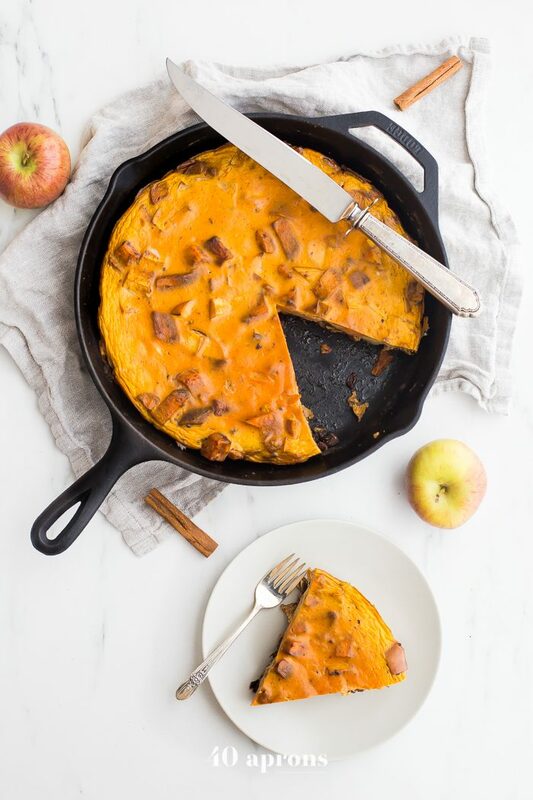 But something magical happened when I wrote my first paleo sweet potato-apple egg breakfast bake several months back: true love. I was desperate for a filling and easy paleo breakfast bake that rewarded me with natural sweetness, plenty of fiber, and tons of healthy fats and protein to keep me full all the way until lunch. And as I first sautéed those sweet potatoes and apples, coated in cinnamon, I knew I’d found what worked for me. Paleo breakfast bake perfection. And is there anything richer, more indulgent, headier than real seeds from a real vanilla bean? I simply haven’t found it. 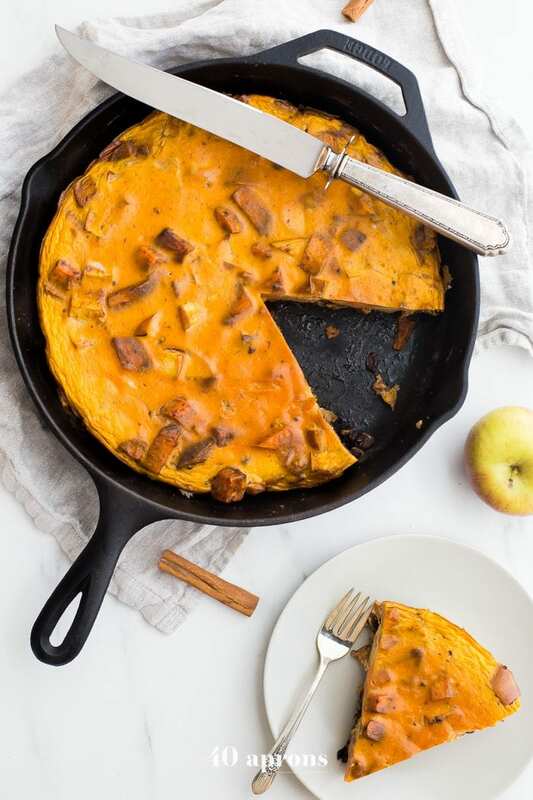 This paleo pumpkin breakfast bake is the real deal, y’all: it’s packed with protein, fiber, healthy fats, vitamins and minerals. It’s easy to slice up and take on the go, since, let’s be honest, that’s how a lot of us are eating breakfast these days. And it’s naturally sweetened, too, thanks to the sweet potato, apple, and raisins! While my lack of sugar cravings these days means I’ve lost my taste for the standard PSL completely, this paleo pumpkin breakfast bake is my favorite way to get that pumpkin spice in your life during the early cooler months. I make a paleo breakfast bake almost every Sunday, and we eat it over the entire week, making breakfast a no-brainer. 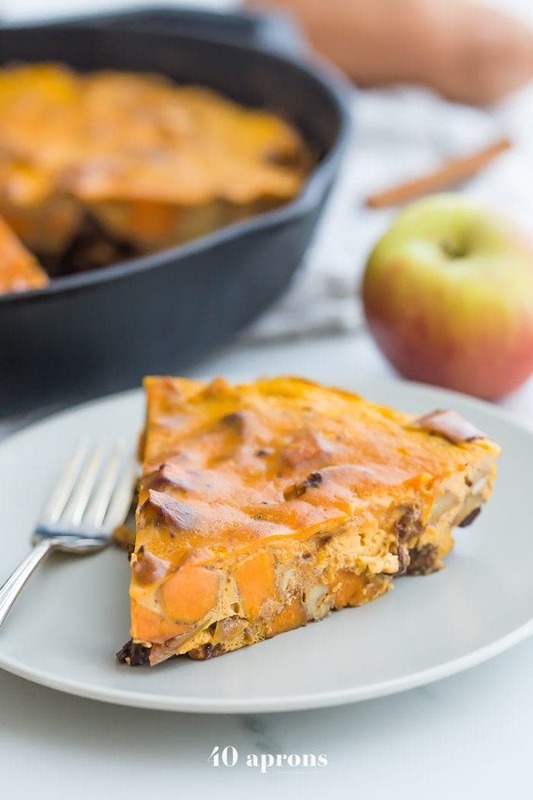 This paleo pumpkin breakfast bake is an autumn dream! With sweet potatoes, apples, pumpkin, pumpkin spice, walnuts, vanilla bean, and plenty of eggs for protein. Seeds scraped from 1 vanilla bean optional but encouraged! Preheat oven to 325º. Heat ghee in a large cast-iron skillet over medium heat, then add sweet potatoes. Cook, stirring often until beginning to soften, about 5-10 minutes. Add in apples, cinnamon, pumpkin pie spice, and raisins, and cook until apples are softened and raisins are plumped, about 8-10 minutes. Both apples and sweet potatoes should be easily pierced with a fork. If necessary, add in a little water to prevent sticking and burning. Add in in walnuts and salt, about 1/4-1/2 teaspoon to taste. Stir to combine well and sauté the mixture a minute or two. In a medium bowl, whisk together the eggs, pumpkin purée, seeds from vanilla bean, and coconut milk until smooth and well combined. Remove apple-sweet potato mixture from heat and pour egg mixture over. Smooth to cover with the back of a spoon. Bake for 20 minutes or until set. A knife stuck in the middle should come out clean. If you don't have a cast-iron skillet (though I highly recommend getting one! ), a 9x13" pan would do. Can you provide the macros per serving ? Can you freeze portions of this? This was delicious but it needed to bake for about 40 minutes in a 13×9 pan. How many inches is a “large” cast iron skillet? My cast iron skillet is 12” wide. The cast iron skillet is already hot when everything starts baking so that might be why it took yours 40 minutes. I’ll try it in a 13×9! I’m glad you liked it! This looks incredibly delicious and I’d eat this every day – Whole30 or not! Whole30 follower or not, this looks fantastic! Love all the fall flavors in there. Perfect way to start the day!